Create rectangles of repositionable paint on a plastic sleeve by painting strips of different widths directly on with the bottle nozzle. 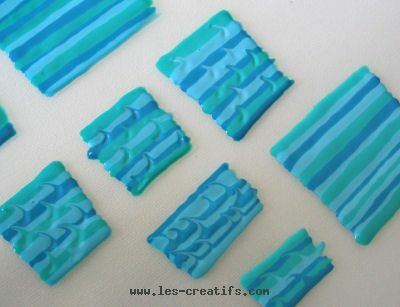 Without waiting for the paint to dry, as soon as a rectangle is finished, take a small piece of wire (or a paper clip), and, pressing down gently, create small rounded indents that cut across two different colored strips, all the way up and down the different strips of paint. Using a special scrapbooking craft knife while leaning on a piece of thick cardboard and cutting all the way round the outside of round objects (small lids etc...). Note that you have to press down hard to cut both this repositionable paint (which is obviously quite thick) and the plastic sleeve at the same time. place the shapes all over the container, the painted side against the glass, then peel off the piece of plastic sleeve. 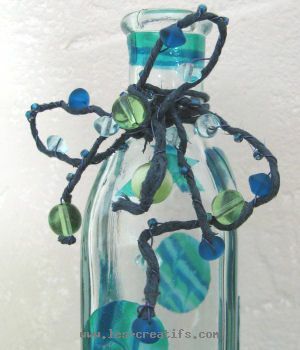 Attach two lengths of string around the bottle neck, winding them twice all the way round the neck. Thread a length of brass wire through the knot, this wire being twice the length of the string that you want to decorate. Wrap the brass wire around the string in a spiral, threading on either a bicone bead or two seed beads (with a twist of the spiral in between), or a round bead. Finish the end of a string by threading on a round bead. Once the four strings from the knot around the bottle neck have been decorated, tie two of them into a bow and arrange the other two as you wish ( as the string is stiffened by the brass wire, it's easy to create a shape). Where can you find the materials for this design idea? les beads, glass, crystal and seed beads are available in the store"